Since writing my last post about mending, I came across the hashtag #menditmay on instagram initiated by Jen of My Make Do and Mend Life. With the aim of celebrating and sharing the magic of mending, she posted a prompt on instagram every day in May to encourage people to get mending. Inspired by this, I have begun to embrace mending as a way of life. Slowly, I see it more as a creative process of problem solving and a mindful exercise of acceptance. Slowly, it becomes less about ticking off a never-ending to-do list. It doesn’t matter, really, that I didn’t mend as much as I hoped in May. What matters is that I am inspired to keep at it. My opposition to mending is founded on a modern-day notion I seem to have internalised that mending is silly, boring and a waste of time. On the other hand, buying new appears so quick, easy, cheap, and fresh. But mending is not silly. In a world with scarce resources it is perfectly rational to minimise waste. It is no less creative to mend than make new. Nor is it a waste of time to slow down, or shift, our consumption habits. Why did I go for weeks on end with that annoying hole in my jacket pocket, having to rummage around the interior of the lining to find my keys? It only took five minutes of hand-stitching to sew it shut. So worth it. Don’t put it off. Many mends are actually really simple. Small holes, loose buttons, seams coming apart. Often it just takes a needle and thread. There is something liberating and empowering in being able to fix something with so simple tools. It doesn’t matter if you mess it up, what you are mending is already worn and torn. 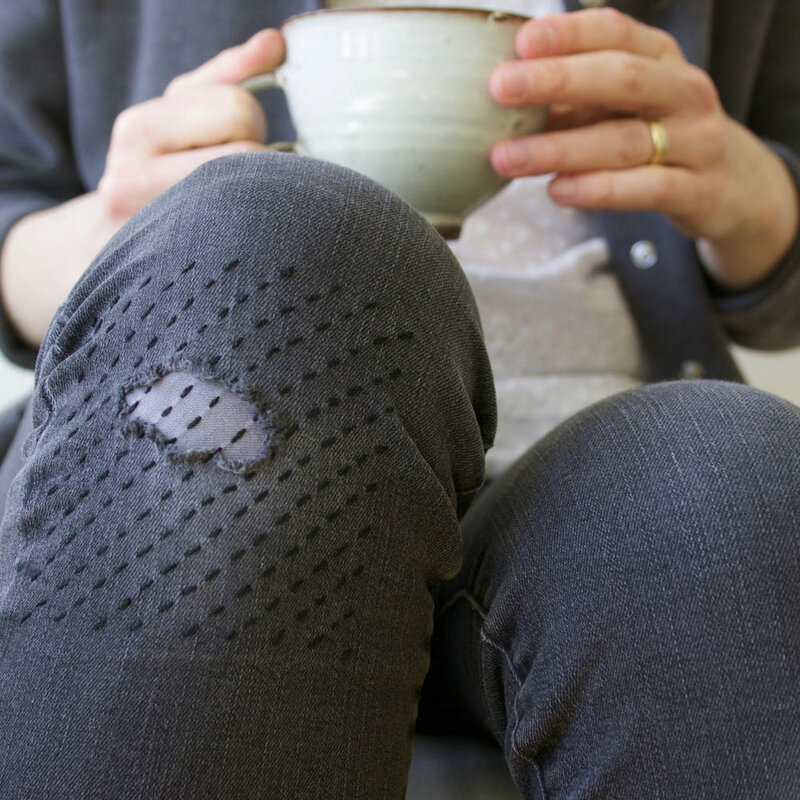 Rough stitching and clumsy patching is perfectly acceptable – hey, even cool! – and if you don’t like it, it’s no worse than it was. Mending is a great way to learn and play without the fear of failure. Mending opens up to a whole range of skills, techniques and age-long textile traditions. Take Japanese sashiko stitching (a tutorial here) or the technical skill involved in invisible mending. Here is endless possibility of exploration and discovery. If you choose. As you mend something you put your own mark on it. It becomes more yours. Mending can serve as a reminder of what you like about your things, and why you bought them in the first place. It makes it easier to be happy with what you do have instead of focusing on what you don't. As I sat down to fix a curling collar facing on my shirt I was struck by how obviously this shirt was constructed in a haste. The underarm seams don’t match up at all. The collar facing wouldn’t have curled if it had been sewn properly in the first place. It takes time and experience to notice quality, and quality is about to be lost in a fashion industry that moves at the speed of lightening. Mending makes you see your clothing from a different perspective. Like all crafting, mending keeps your hands busy and gives your mind space to wander. It slows you down to the pace of your hands and the speed of your stitching. It keeps you present with a specific task to solve. It is grounding. Mending slows down our collective consumption habits. By mending you don’t need to consume at the same rate. And you may be inspired to shift your consumption, recognising the value of quality over quantity. It is slow, it is analogue, it requires simple tools and builds on old traditions and skills. But mending is not out of date. Mending challenges the idea of clothing as disposable consumer goods, and gives us instead the power to make them last. 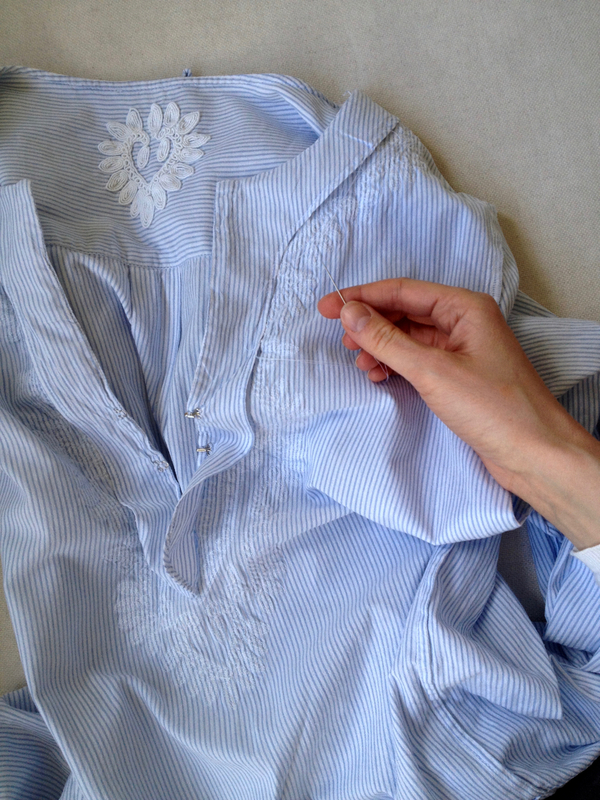 Mending means owning up to reality – wrinkled, faded and all – and taking responsibility for that. It is a process of acceptance. It means searching for beauty in what is and celebrating where you are. Newer PostWhat is slow fashion?